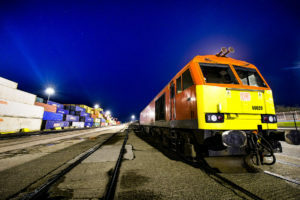 Peel Port and DB Cargo have joined up to created new rail service for containers between Liverpool and Mossend near Glasgow. The service will initially run three days a week, beginning on the 8th of May. The service will carry more than 40 containers per trip and comprise of 30 wagons. “This is an important milestone event for us and our partners, DB Cargo,” said Peel Ports container director Jouke Schaap. “We’re delighted to be working alongside Peel Ports on this exciting new initiative,” added Hans-Georg Werner, DB Cargo UK CEO. “Introducing express rail services between Liverpool and Mossend is a really sustainable solution, significantly reducing the need for HGVs to travel thousands of miles on our roads each week,” said Werner.